Martian Coasters is a set of four colorful 4" beverage coasters, each featuring a small gameboard. Playing a game of Martian Coasters requires a Treehouse set and a standard six-sided die (not included). 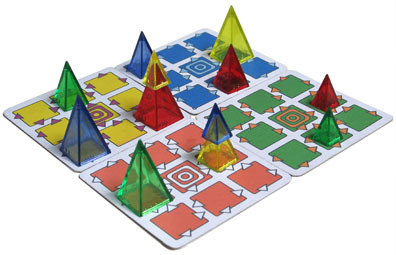 Each player has three pyramids of one color, which are distributed around the set of four coasters. The object is to move all of one's pyramids onto the coaster/gameboard of matching color and into a nested stack on the center of that board. Arrows on the boards limit the directions in which a piece may move; meanwhile, the distance each piece may travel is determined by its size, and limited by the luck of the die rolls. Best of all, each turn the Treehouse die sets off a variety of actions on the gameboards themselves, which include rotating the coasters, swapping pairs of coasters, and even "hopping" a coaster to another edge, breaking the universe out of its initial square configuration. Martian Coasters was designed by Andrew Looney and should not be confused with Cosmic Coasters, a totally different game he made using beverage coasters. 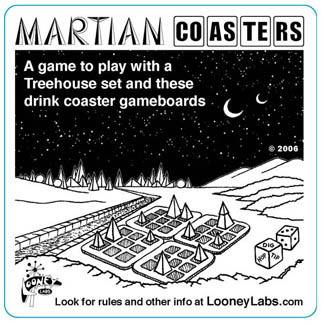 Sept 7th 2006: Coming Soon: Martian Coasters! Oct 5th 2006: Martian Coasters are at the Printers!